benefits such as dimmability, longer life-span, and efficiency. In addition, the demand for HB-LEDs in backlighting, portable appliance, displays, and large screen display applications has increased significantly and is projected to endure during the forecast period. 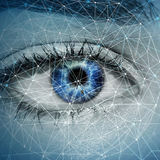 Free Download Sample Report Pages for Better Understanding@ https://www.acumenresearchandconsulting.com/request-sample/1270 The research study estimates the global High Brightness (HB) LED market to grow at a significant rate and the market size was over $22 billion in 2017. Asia-Pacific is the largest market for High Brightness (HB) LED supported by growth from India and China Asia-Pacific has contributed the maximum revenue share in 2017 and is expected to uphold its lead in the forecast period. This would be attributed to several factors, for example, LED outdoor lighting installations and the government policies related for the installations are getting support mainly in emerging markets such as India, Russia, Vietnam, Malaysia, Indonesia, and Thailand. Furthermore, improvement in government expenditure in LED orders has enhanced the HB-LED growth in Asian countries, particularly in India. North America is anticipated to be the fastest growing region during the forecast period. 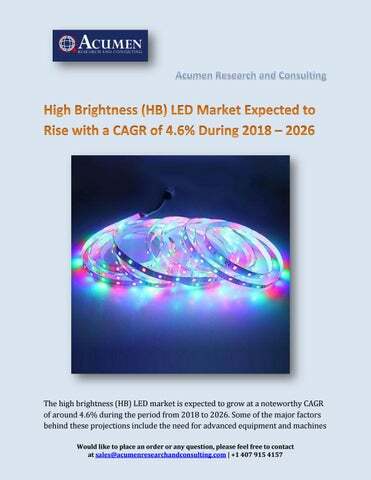 The growing shipments of portable devices and decrease in the cost of LED components are key driver for HB-LED market in the region. Furthermore, expanding demand for brighter and ecofriendly LEDs in commercial applications, automobiles, and displays are some of the key factors that are contributing toward the growth of the market. Several government initiatives across the globe to detain the usage of traditional light bulb and to use LEDs is also a key factor for the increase the demand and sales of high-brightness (HB) LED. Moreover, Central & South America, as well as MEA, are expected to grow on account of the presence of a large aftermarket.